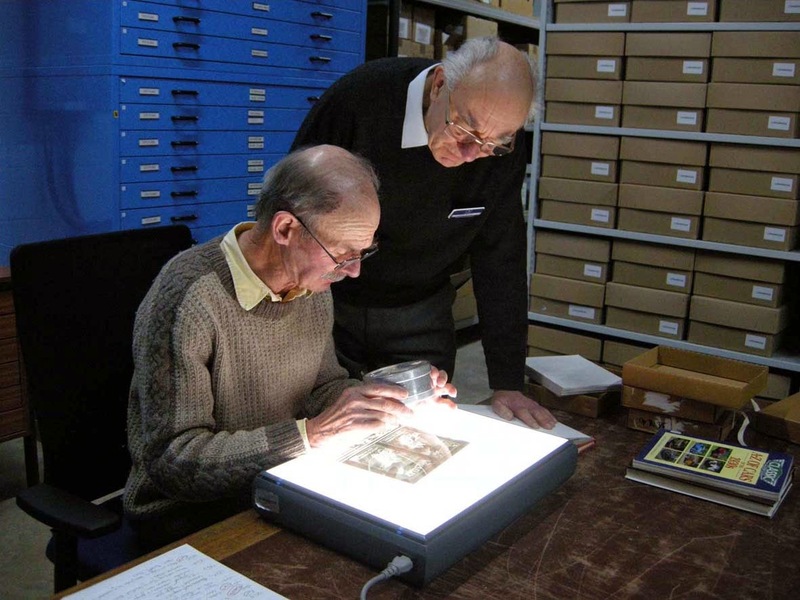 Whilst this blog has always featured the activities of the volunteers recruited in 2012 as part of the new Museum Collections Centre, we certainly must not forget the work of Colin, Oliver and John, who between them have been volunteering for a total of around 24 years already. They are very much the back room boys, working out of the archive department, with a huge collective knowledge of the British motor industry. The archive collections originated from the British Leyland Corporation, which began gathering such material from its constituent companies in 1975. The archive’s role is to preserve the surviving records of some of the most famous names in British motoring history. This comprises of; brochures and sales literature, press material, workshop manuals and handbooks, production records, business records, which include things like minutes from board meetings, films, negatives and photos. Colin evaluating documents and transferring them to an acid-free box. Behind is an expanse of sorted boxes. The British Leyland archives are at the core of the collections, but in addition other automotive supplier companies such as Lucas Industries are represented. They also feature the work and history of people such as Herbert Austin, William Morris, and Alec Issigonis plus items likethe archives of motoring journalist Nick Baldwin. Colin, perhaps better known as the Vicar of Longbridge, has been volunteering the longest at around 13 years. His broad knowledge of the British motor industry is a huge asset to the department and he has under taken many sorting and cataloguing tasks over the years. His specialist subject is without doubt the life and times of the Austin Allegro. Oliver is a former BBC editor and has been volunteering for 10 years. He tends to specialise in the sorting and labelling of film material, as well as working with the archive’s oldest glass negatives, dating back to as early as 1900, which have up till now been unlisted and unsorted. John is the new boy, who joined the team just over a year ago. He's a retired long time Longbridge engineer with a detailed knowledge of the company. One of John's main tasks has been to help with the sorting and reboxing of material that were rescued from the Longbridge factory when MG Rover finally closed in 2005. Details of the archive services, together with a list of all the marques for which records are available can be found on the Heritage Motor Centre's website, here. You can also see the link to "Document of the Month" a new feature just launched which is well worth a read. Please also do have a look at the FAQ link which covers the main queries received by the department.